To try real street food you’ll have to get out of the tourist centre. There are some great eats within walking distance, or a short scoot by xe om. Thit bo nuong la lot is a popular late afternoon street in many place, ex: Hanoi Vietnam, Saigon…but it’s processed dilicious in Nhatrang, Vietnam . 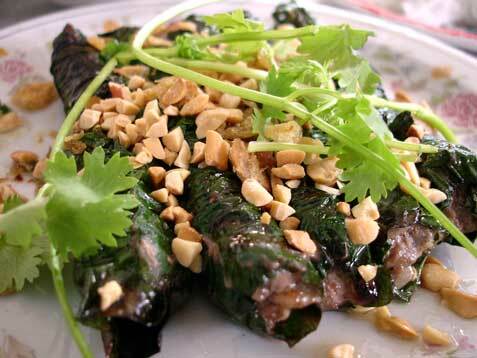 Beef is wrapped in lo lot leaves and grilled, with the leaves imparting a herbal flavour to the meat while holding in all the juices. You can try it on Bach Dang Street, at the corner with Mac Dinh Chi, for 4,000 VND apiece. Good luck sitting on the miniature plastic stools. Here you can also get another tasty snack, banh trang nuong, grilled rice paper topped with ingredients like quail egg, green onions and minced mushrooms for a crunchy, smokey, savoury treat — only 7,000 VND each. Nem nuong Ninh Hoa is a feast-with-friends, eat-with-fingers type of dining experience. Nem nuong is found throughout Vietnam travel but this particular style originated in Ninh Hoa district and is now famous in Nha Trang. Your table will be filled with platters of grilled pork meat balls, lettuce leaves, rice paper, fresh herbs, chillies, rice vermicelli and garlic. You make your own wrap and dunk the roll into the sweet-spicy fish sauce. There are two large restaurants on Nguyen Thi Minh Khai, west of Nguyen Thien Thuat. Look for the signs Quan Nem Ninh Hoa Nha Trang. A set works out to be around 40,000 VND per person. You can also get nem nuong at Ngoc Tien at 59 Le Thanh Phuong, a block south of Yersin Street, and at Nem Dang Van Quyen at 16A Lan Ong Street, a few blocks west of Michelia Hotel and the ocean. Nem Dang Van Quyen does a delicious bun thit nuong, a filling noodle salad that’s the perfect cheap lunch on a sweltering day. Cold rice vermicelli noodles are topped with grilled lemongrass pork, fresh herbs, peanuts, shredded lettuce and a sweet, salty dressing — a bowl is only 40,000 VND. The joint occupies two spots across the road from each other.